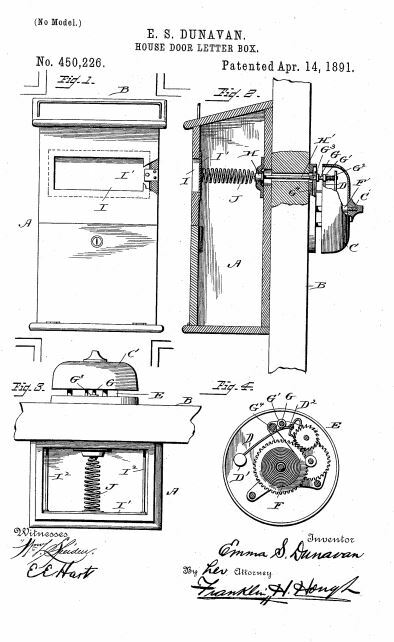 In 1891, Emma S. Dunavan, of Dayton, Illinois, received a patent on a new and useful improvement in the class of mailboxes intended to be placed on the door of a building, including a bell linked to the door of the mailbox which would ring when mail was deposited. The full description of this invention may be seen here. Emma was the wife of William J. Dunavan, son of Albert F. and Emma (Cooper) Dunavan, and grandson of William Lair and Eliza (Green) Dunavan. He was the junior member of the Fox River Horse Collar Manufacturing Co. in Dayton, in partnership with his father. William traveled a great deal in connection with the factory and in October 1887, he opened a wholesale and retail store of horse collars, harnesses, buggies, etc., at Kinsley, Kansas. An Illinois Lady, Formerly of Fort Scott, Invents a Useful Contrivance. Yesterday the scribe dropped into the office of Dal Burger’s Fort Scott Carriage Works on his rounds and was shown a newly patented mail box that is certainly getting near the acme of achievement in its line. The box is the invention of Mrs. Emma S. Dunnavan, of Ottawa, Illinois, who was formerly well known here as Miss Emma Swank, and is the daughter of Mrs. Agnes Swank of this city. It consists of an ordinary wooden or metal box of the usual form and size, with a spring door near the top through which the letter or card is put. A push button extends out from an opening above the door, which is used in opening the latter. When the button is thrust in by the postman as he pushed back the door, an electric bell is set ringing which calls attention to the postman’s visit as the whistle commonly used now does, but in a surer and at the same time a more genteel manner. The ring is surer because the bell is rung inside the hall or room. The intention is to place the box on the outside of the door, the bell being placed inside. This does not disfigure the door as the box can be made as ornamental as may be desired, and the bell is much like an ordinary door bell.